Every dog is different. Every family is different. The relationship we have with our dog can create great joy; it can also create frustration, fear, embarrassment and many other emotions. A cookie-cutter approach may work with "easy" dogs, but some wonderful dogs are more challenging and they may require a more unique approach. ​My goal is to empower you to decide ​what approach feels best for you, your family and your dog (rather than tell you what you "should" do). The approach is part investigative, part educational, part therapeutic and part hands-on. In a typical session, we will define and clarify what you would like to accomplish, discuss the pros and cons of different approaches, determine what you feel comfortable doing and then go over how to implement the chosen strategies. 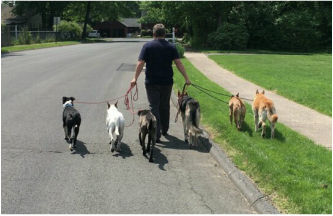 a calm, happy "6 pack"
At our first consultation, you will receive a copy of The Canine Strategies Workbook. The workbook is designed to educate you, challenge you and to help you create a customized strategy to strengthen your relationship with your dog. Depending on what your goals are, we may go through the workbook together or use it as reference for specific items that are important to you. ​We can meet at your home, at a local park or any other appropriate locale. It is recommended that you have the Workbook in-hand before any phone consultations.